The ULTIMATE for RV Traveling! PRODUCTS THAT LOOK LIKE THEY BELONG!!! Use it over and over again! Hang it or carry it! 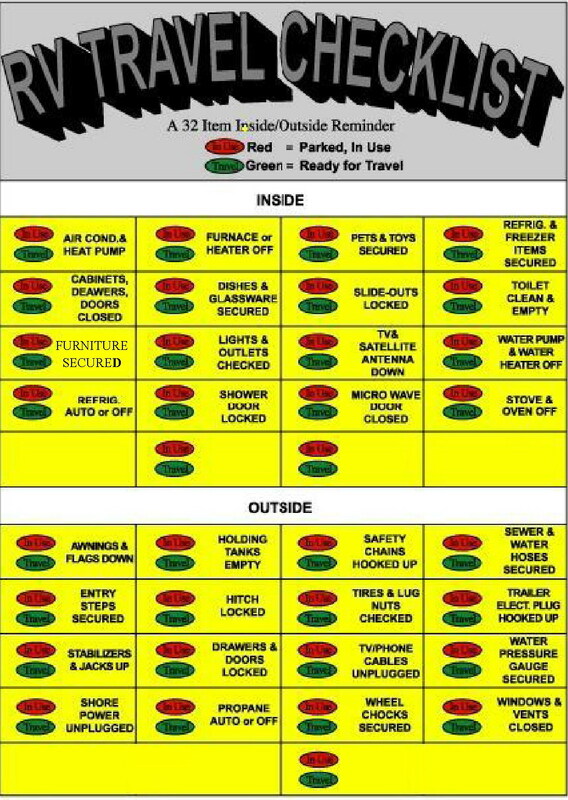 * Just turn it on to check and to keep track of many items inside & outside of your RV. * The RV Electronic CheckList has precision circuitry & has special LED components. * Ideal Electronic reminder for trailers, tow vehicles, motor homes, and 5th Wheelers. * The versatility of the RV Electronic CheckList allows it to be totally portable or permanently fixed. * 4 CheckLists to a pack. Good for four travel outings. * A log to help you remember to store & secure all items in & around your RV. * Increases safety, & avoids loss of items in your RV unit. * The same reminder can be used for trailers, tow vehicles, motor homes, and 5th Wheelers. * Powered by 4 "AA" Batteries, (included). Remove batteries if CheckList not going to be used for a long period of time. * On/Off switch located on upper right side of CheckList. * Weighs only 16 ozs. * It's electronic, just push the switch to RED when you have secured the specified item for "parking your vehicle" for the night. * When you have all the items in RED, you know you are ready & set up to enjoy your stay. * When all of the items have been switched to GREEN, you know you are ready to travel. * Keep Batteries & battery compartment door away from unaccompanied children as small parts could be swallowed. * Use your fingernail, a coin, or someone else's fingernail to scratch off the silver oval to the left of each item when you have parked your RV or when you are preparing to travel. *The top oval is RED to signify "In Use" or "Parked". *The bottom oval is GREEN to signify "Ready for Travel". damages & replacements to your RV or personal property. The ultimate way to monitor & secure all of your expensive RV appliances, & equipment before & during your travels. Each one contains 16 Inside & 16 Outside of the most common items that maybe overlooked, misplaced, forgotten, or not secured before you are ready to travel. It also has 4 "write-in" spaces for items & instructions that are unique or special to your RV unit. No more worries about "Did I put down the TV Antenna?" "Did we get the sewer hose?".... "Why didn't I check behind the Slide outs before I slid them out?..." "I forgot to latch the shower door..."
For complete shipping & return information, refer to the "About Us" section.